In April 2015, Mobilegeddon took the Internet by storm. A Google algorithm update was rolled out with the intention to give ranking prominence to websites that were mobile-friendly. A couple of weeks later, Google revealed that mobile search overtook desktop search in 10 countries, including the US and Japan. This was search traffic sent from browsers and mobile search apps. If you thought ecommerce was a boom, consider this – it has been suggested that mobile commerce will grow 300 times in the period between 2014 and 2019 or around 40% between 2013 and 2016. Mobility is the principle of our way of life. Embracing this in your business approach can be a goldmine or at least a way to survive evolution. Is the situation really that serious? Well, let’s see. An SMB business in San Diego County, which counts a bit more than 3 million people, has a competition of around 77,000 businesses with at least one paid employee, which doesn’t include some 240,000 self-employed entrepreneurs. Build for mobile or face the consequences. Google has been kind enough to publish a tool that will tell you where your website stands with respect to mobile optimization and they outlined the steps to get the “mobile-friendly” label. The basic principle of mobile optimization is ease of use. Media Post has cited that almost half of the respondents in a mobile-shopping survey said this was the most important quality they were looking for in a mobile site. This is part of enhancing user experience, which is a ranking factor, and common mistakes include content that cannot be played, interstitials, slow loading, dense buttons, etc. Making a mobile-friendly site easy to use means making it easy for the visitors to complete their objectives. A business has to explore what their typical customer does on their mobile and what they want to do on their business’ website. The answers will inform what information should be prominently displayed and what tasks should be best supported. This brings us to the concept of user intent, which has become a major drive for SEO. Taking into account the intent of your website visitors and building action-oriented content encourages conversion. 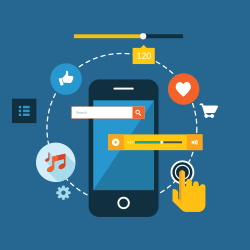 Mobile optimization also involves local SEO efforts, because what mobile searchers typically look for are local businesses – they want to find out what businesses are nearest to them, what the office hours are, check reviews, etc. San Diego SEO should be imperative for mobile strategy of San Diego businesses in 2016. What about the mobile site design? Currently, there are three options available: responsive, adaptive and separate URL. It’s not clear whether the configuration plays a role in the rankings, but Google has stated very explicitly that they prefer responsive web design (RWD). This pattern means the website has fluid grids that adapt to the platform, as well as flexible images and variant CSS styles. Since RWD means the URL and HTML of the website stay the same that makes it crawler-efficient for Google and saves their resources. However, Google points out that RWD delivers a better user experience and prevents the risks of bad redirects and fragmented links like with adaptive design and separate URLs. Local SEO efforts go hand in hand with optimizing for mobile. Mobile-optimized websites deliver exceptional user experience focusing on ease of use and action-based content. Responsive design is Google’s preferred pattern.